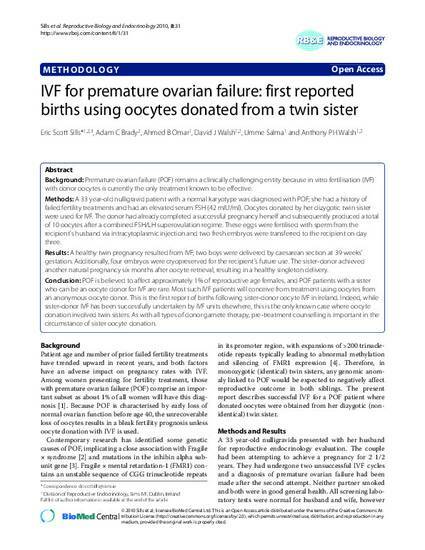 IVF for premature ovarian failure: first reported births using oocytes donated from a twin sister. BACKGROUND: Premature ovarian failure (POF) remains a clinically challenging entity because in vitro fertilisation (IVF) with donor oocytes is currently the only treatment known to be effective. METHODS: A 33 year-old nulligravid patient with a normal karyotype was diagnosed with POF; she had a history of failed fertility treatments and had an elevated serum FSH (42 mIU/ml). Oocytes donated by her dizygotic twin sister were used for IVF. The donor had already completed a successful pregnancy herself and subsequently produced a total of 10 oocytes after a combined FSH/LH superovulation regime. These eggs were fertilised with sperm from the recipient's husband via intracytoplasmic injection and two fresh embryos were transferred to the recipient on day three. RESULTS: A healthy twin pregnancy resulted from IVF; two boys were delivered by caesarean section at 39 weeks' gestation. Additionally, four embryos were cryopreserved for the recipient's future use. The sister-donor achieved another natural pregnancy six months after oocyte retrieval, resulting in a healthy singleton delivery. CONCLUSION: POF is believed to affect approximately 1% of reproductive age females, and POF patients with a sister who can be an oocyte donor for IVF are rare. Most such IVF patients will conceive from treatment using oocytes from an anonymous oocyte donor. This is the first report of births following sister-donor oocyte IVF in Ireland. Indeed, while sister-donor IVF has been successfully undertaken by IVF units elsewhere, this is the only known case where oocyte donation involved twin sisters. As with all types of donor gamete therapy, pre-treatment counselling is important in the circumstance of sister oocyte donation.